The Old Testament lectionary reading for the day includes the story of God creating humans and placing them in the garden AND the story of sin entering those human lives and thus our lives, as turning away from what God intends. If dealing with younger children, it would be best to emphasize the creation of human being, rather than the specifics of sin and disobedience to God’s intent. 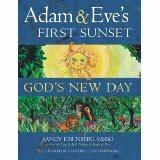 Thus, we recommend Sandy Eisenberg Sasso’s Adam and Eve’s First Sunset: God’s New Day (Jewish Lights Publishing, 2003) ISBN 1580231772. For a similar creation connection, you might also try Reeve Lindbergh, The Circle of Days (Candlewick Press, 1998) ISBN 0763603570, which adapts Saint Francis of Assisi’s Canticle of the Sun as a celebration of the Genesis creation story. The epistle text for this week is a difficult Pauline theological argument about the atoning work of Jesus Christ that justifies us with God (lines us up aright with God’s will, despite our brokenness). Justification is a difficult theological concept for abstract thinkers and thus our advice is to focus on “reconciliation” in this text, when talking with children. While the word “reconciliation” may be a difficult, on, the idea of arguing, fighting, broken, hostile, and/or separated persons who are reunited through sheer forgiveness, is something children may experience and begin to associate with God’s relationship to us. Robert Coles, The Story of Ruby Bridges (Scholastic Books, 1995) ISBN 0439598443 would be an appropriate book to use since it tells the true story of amazing racial reconciliation, possible only through the power of God at work in one little girl. It is the real life story of Ruby Bridges, the small African American girl who not only faced the danger of integrating William Frantz elementary School in 1960, but did so with a gentleness and love for those who hated her…a reconciling love empowered only by her own and her family’s faith in the reconciling God. This biblical text of unearned reconciliation can be linked to the racial reconciliation enacted by a little girl and then to our own call to reconciliation as action of faith, empowered by the reconciling God. The book is a bit longer than some, but well worth the time. This week’s Gospel text is the story of Jesus facing temptations in the “wilderness” before he begins his public ministry. With children, rather than emphasizing the “devil” or tempter in this story (which might lead children to interpret this story as similar to some fairy tales with a wicked witch or other evil character, rather than recognizing the temptations all humans really regularly face), we are choosing to focus on the very real description of how we ALL face temptations, great or small, and how God our loving parent takes action to come to us, be with us, and hold us even when we succumb to “temptations.” For this emphasis, we suggest using the classic children’s book Down the Road, by Alice Shertle (Voyager Books, 1995/2000), ISBN 0152024719. In the story, young Hettie tries to do the “good” thing, but succumbs as we all do to actions that might hurt others, harm relationship, or step away from what God wants for us, as she gets distracted from her mission to bring eggs home to her parents. When Hettie breaks all the eggs, and climbs a tree in shame, afraid to go home, her parents come find her and transform her situation from brokenness to whole relationship. The story functions as a metaphorical story of God’s reconciling action on our behalf. The Lectionary Links for this Sunday are written by Union Presbyterian Seminary professor Dr. Pamela Mitchell Legg. Lectionary Links: Sunday, March 13, 2011 by Storypath is licensed under a Creative Commons Attribution-NonCommercial 4.0 International License.